"Mommy, I promise I didn't eat the cupcake." I'm voting for my baby Bailey, she wants to win some of those yummy treats and brag about it to our new kittens. She feels left out, now that they are here. I want her to feel special and recieve a fun box in the mail. Voting for Bailey - HOW can you resist those eyes..?! Voting for Bailey - I agree! Look at her eyes! she is beautiful!! Voting for Bailey - she is such a sweetie! I want to vote for Baily too! What a cutie and it looks like she has quite the personality! Voting for Bailey – such a little darling! What a cutie. My vote is for Bailey, no way any one can resist those eyes.. my absoulute fave is that gorgeous color pattern around her eyes... so perfect.. just like BAILEY!!! Yey Bailey, hope you win those special treats! Gooooooo Bailey! Hope you get to make those kitties jealous. ;) My vote's in for you dah-ling! You've got my vote Bailey, you can do it! Go, Bailey, go! You little cutie!!! voting for Bailey... she's oh so cute! Bailey is my pick, she's a cutie! I vote for Bailey. I just want to pick her up and kiss her tiny head!! voting for Bailey. What a cutie. Bailey is such a cutie. I'm voting for her! Go Bailey! You have my vote! I'm voting for Bailey, she is so adorable! 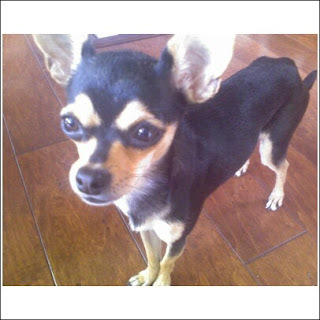 I want to Vote for Bailey, I have chihuahua's myself and they are so much fun! Making kittens jealous is always a worthy goal. Voting for Bailey!! she is a cutie! Such a cutie. You get my vote. Bailey has my Vote! she looks similar to my doggie! Bailey is adorable and I vote for her and I believe her too! Voting for Bailey because she is so cute! i love chihuahuas, small but terrible little cuties, have one too, chocomani. so i'm voting for you bailey!! How could such a cute little pup like that eat the cupcake, I vote for her. I have no choice but to vote for Bailey....I love my little Bailey! She is such a sweetheart and look at the face!Molly misses you Bailey! Gotta vote for Bailey... look at those ears! I VOTE FOR BAILEY <3 she's pretty darrrrn cute! Bailey is soooooo adorable!! She is for sure the top dog in this competition!! Good Luck! SO cute! Hope you win Bailey! Voting for bailey! Sooo cute! Voting for Bailey, such a sweetie. I'm voting for Bailey. Too cute. Bailey is SO cute! Here's my vote for her!